January 21, 2019 by Shikha Mane, M.D. Contact dermatitis is a skin condition that presents with a rash that occurs when the skin comes into contact with either a substance that causes irritation or an allergen that causes an immune response. 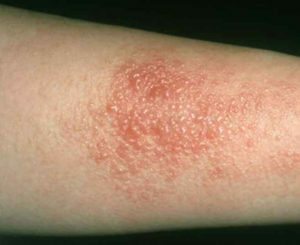 The skin can become red, itchy, or painful. It can occur at any age. Contact dermatitis can be classified as either irritant contact dermatitis or allergic contact dermatitis. This is the most common form of contact dermatitis and it can develop immediately after an irritating chemical touches the skin, or if the skin is rubbed too hard, or if the skin comes in contact with heat. Examples include: diaper rashes, acid burns, irritated skin around the mouth due to saliva while lip licking or lip smacking. Certain toxic substances can quickly irritate the skin, such as battery acid, bleach, rubbing alcohol, fertilizers, pesticides, or pepper spray. Water, foods and soaps are typically less irritating; however, irritant contact dermatitis can occur from these items if there is frequent and repetitive exposure. Certain occupations that require frequent hand-washing or handling of chemicals may predispose an individual to having irritant contact dermatitis. Nurses, beauticians and bartenders are a few examples. Overall, the amount of exposed skin and the length of time of the exposure determine the degree of irritant contact dermatitis. Symptoms are usually a burning or stinging sensation to the skin with redness, swelling or peeling. Allergic contact dermatitis results from the body’s immune system recognizing a chemical as foreign and subsequently having an inflammatory response against that substance. As with any allergic condition, allergic contact dermatitis typically requires previous exposure to an allergen (sensitization). If a person has an underlying allergy to a particular chemical, upon re-exposure, the skin can start reacting several hours later and in some cases it can take up to 48 to 96 hours after exposure to develop a reaction. The most common skin reactions include red, hot, itchy skin that may blister, weep, or ooze. It may take only minute quantities of an allergen touching the skin to provoke a reaction. If a person is continually exposed to a causative agent, the skin can become very inflamed and it can be difficult to distinguish from atopic dermatitis (eczema). Also, it may take several weeks to heal even if the causative agent is eliminated. Individuals with underlying atopic dermatitis and those in certain occupations, such as health care workers, construction workers, cleaners, hairdressers, chefs, and mechanics, are at higher risk of having an allergic contact allergy. To diagnose allergic contact dermatitis and to differentiate it from atopic dermatitis and irritant contact dermatitis, a detailed history and examination of the skin is required. Sometimes, a “diary” of when the symptoms appear, get worse or improve can help aid in the diagnosis. Additionally, for individuals that have high exposure to chemicals through their work place, Material Safety Data Sheets (MSDS) may be available to help identify a causative agent. 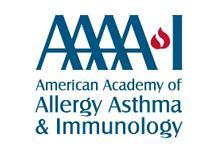 Patch testing is used to help identify the underlying cause of allergic contact dermatitis. With this form of allergy testing, up to 70 small patches of diluted chemicals are placed on the back. Individual’s suspected personal products can also be used for testing as well. After 48 hours, the patches are removed and the skin is scored at that visit and then again at the 72 hour mark. The skin is scored from a scale of negative to 3+ positive. If a local allergic reaction is produced, it can help identify the offending agent which can then be avoided in the future. If a culprit is identified, the best treatment is to avoid that particular substance. If avoidance is not possible, the rash can become chronic, disabling and can lead to a decreased quality of life. The recommendation is to rinse the skin with water and a mild soap immediately after coming in contact with a known irritant or allergen. Protective gloves or clothing while handling harsh chemicals and/or allergens will help decrease the risk of a skin reaction. For mild allergic contact dermatitis symptoms, cool compresses, antihistamines, moisturizers or topical corticosteroids may be prescribed. Topical antibiotics may be prescribed if there is evidence of secondary bacterial skin infection. For more severe reactions, oral steroids may need to be prescribed to help treat the underlying inflammation. Because allergic contact dermatitis is a delayed allergic reaction, even after proper treatment, it can take up to 2 weeks for the rash to heal. Our physicians at North Texas Allergy and Asthma Center are all board-certified experts in the diagnosis, treatment and management of contact dermatitis. In addition to our standard patch testing panel, we also have a specialized patch test for metals and another specialized patch test for the pediatric patient. If you or your loved one has a history of eczema, or has experienced an irritating red rash, you might have an underlying contact allergy. Our board-certified allergists will take a detailed history, physical exam, and appropriate testing to help diagnose and treat your skin condition. Working together with you, our allergists will develop a comprehensive and personalized treatment plan. You do not have to live in discomfort. Contact our office for an appointment. We can help.